There's a lot of debate on the popularity of Ron Paul. The media says Ron Paul's popularity is inflated in the polls due to spam bots. 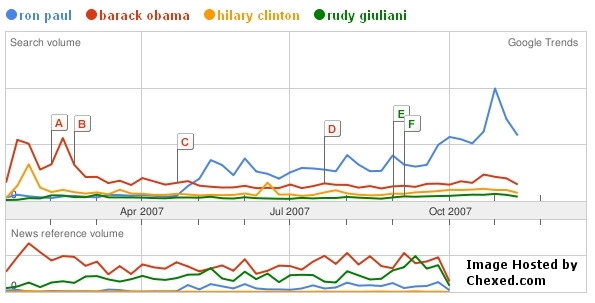 Let's take a second look at Ron Paul's popularity WITHOUT the polls stacked up against Barack Obama, Hilary Clinton, and Rudy Giuliani. Information for image gathered from http://google.com/trends for press educational purposes. Actual current graph for 2007. In case you're wondering, what makes me think someone didn't configure spam bots to search for Ron Paul on the internet? If they did that, they wouldn't only have done it on Google, they would have done it on Yahoo as well. Obviously, Yahoo was not spammed with keywords "Ron Paul" as of this current date, or Ron Paul would likely be in the number one position for their top searches. Information for image gathered from http://buzz.yahoo.com/overall/ for press educational purposes. Last but not least, one more way to show you that Ron Paul's Popularity is not inflated is through another third party source, Alexa. It ranks the popularity (or traffic) of websites across the globe for analysis. When I compared some of the top US 2008 Presidential Candidates websites, Ron Paul came out way on top of the other candidates. You may say that Ron Paul supporters could be sending fake traffic to his website (via automated web bots). That would be highly unlikely, considering most web bot programmers are family with the web and know sending fake traffic to a website could over load it and make it slower. Supporters aren't going to want his website slow or broken. So here is my last piece of current evidence that Ron Paul's popularity is NOT inflated. Information for image gathered from http://www.alexa.com/ for press educational purposes. Actual current graph. Do you think Ron Paul's popularity is fake? I don't! They have over 75,000 members in over 1,000 cities across US. First time in my voting history that I don't feel like I have to vote for the lesser of two evils. I love what this guy represents. Hosted by HostNine This page was created in 0.00305700302124 seconds.